After I was done nursing Sadie and switched her to formula, I felt pretty good that she was getting all her vitamins and minerals she needed from her bottles. I kept her on formula til she was about 14 mths because I called it her brain food. I then slowly switched her to cows milk and the once she started to eat big people food I worried about giving her a balanced diet. 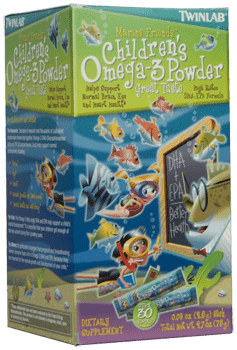 We always got the formula with Omega 3 and 6 in it so I was very excited to start her on the Children’s Omega-3 Powder I received for review from Twin Lab. It comes in a box of 30 stick packs all individually wrapped so you can throw it in their lunch or your bag to mix up with their food when it is time. I have put Sadie’s in her oatmeal, applesauce, yogurt, pudding and she has never said anything about the taste or asked what it was as she seen me sprinkle it on. It looks like milk powder and it easily dissolves with whatever you mix it with. It contains no artificial flavors, colors, preservatives or sweeteners. It has 15 cal per stickpack and 1.5g of sugar. The Children’s Omega-3 Powder helps support Normal Brain, Eye and Heart Health. If your looking for ways to add Omega-3 to your child’s diet this is the way to go. Receive 20% off with the coupon code HEALTHYKIDS3 valid only on the TwinLab.com website. I LOVE this! I have re-tweeted it, please enter my name. Thanks! Please enter my name in this nice giveaway – I have re-tweeted it. Thanks!